Features: The bowl cleaner that offers safety, ease of use and cleaning effectiveness in one product. A special blend of ingredients attacks hard water build-up, rust and stains. EPA registered. Sky blue in color. Appealing sassafras scent. 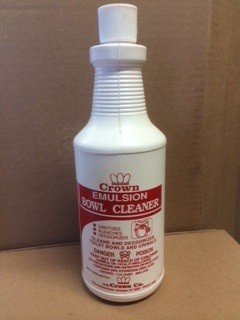 Uses: Recommended for cleaning, disinfecting and deodorizing toilets, urinals, etc. Composition: Contains 9.5% hydrochloric acid plus quaternary ammonium compounds for superior disinfecting. Also contains detergents and corrosion inhibitors. Packed in quarts.